The Tempest MasterBelt® is ideal for mobile production and offers all the advanced features, reliability, and robustness of the Tempest2400 rack-mount BaseStation in a compact, portable, and easy-to-deploy package that can be conveniently worn on the hip. The Tempest MasterBelt is designed to act as a Tempest BaseStation. This enables the Tempest Wireless technology to be used in applications where users move together within the same workspace. Because the Base is a Belt, there is added flexibility for the group to be on-the-go. The MasterBelt can be paired with any standard Tempest2400 2-channel BeltStation to create a full-featured 2-channel system in the 2.4GHz band. The MasterBelt supports two intercom channels (A/B) and can support up to five BeltStations operating in full duplex simultaneous communication. 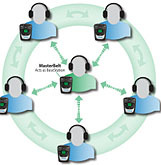 The MasterBelt also functions as the 6th full-duplex wireless user in the system.